We are a local Ladakhi family, who have worked on this arid landscape for years to make it a livable farm. In the summer we have a organic vegetable garden and a small green house for the winter. We also have a our own wheat and barley fields grown nearby and a few cows and dzos - (a cross between a cow and a yak). Guests can enjoy freshly baked Khambir ( local Ladakhi whole wheat bread or Sour Dough) and the fresh milk and vegetables from our garden. Home cooked local Ladakhi and Indian cuisine with a fixed menu will be served. Please let us know if you have any food preference, like vegetarian only, any food allergies and we will try to take care of it. Our landscape is also changing with the seasons, all the leaves fall during winter and we get new leaves and glacier melt water only in spring, so don't assume that the place will look like in the photos your see throughout the year. The weather and landscape of Ladakh is very unpredictable and during the change of seasons we get sand storms, which can be quite scary. Last year we had a torrential rain which cut us from Leh and people were stranded for few days before the roads could be restored. Our advice to tourists travelling to Ladakh is to be always prepared for the unexpected, this is a high altitude cold desert and the mild weather can change anytime. One day acclimatization in Leh is required before crossing Khardung La. We welcome guests to come and stay on our farm and share our experience and culture. 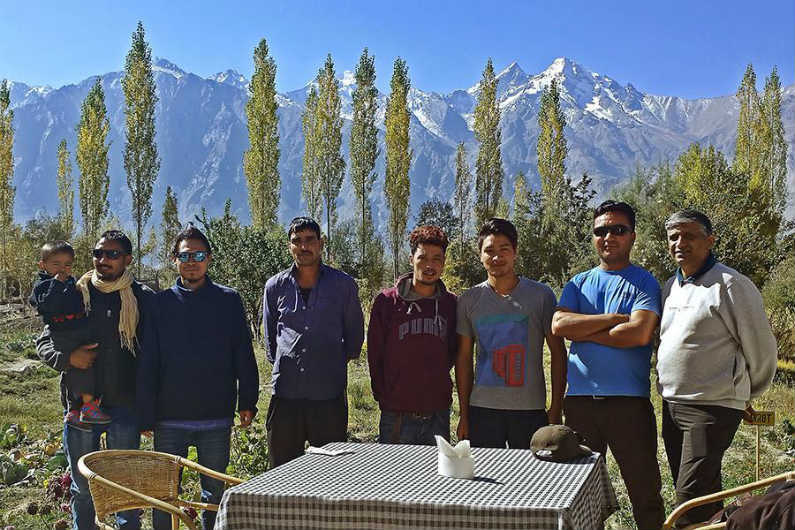 We are not a resort or a hotel, this ecotourism venture is intended to give tourists a feel of the local Ladakhi way of life and hospitality while giving an additional income to our family and staff, helping the local economy. From Leh get a private car, taxi , bike, or shared cabs from Polo ground in the morning, also by bus once or twice a week. It's about 5 to 6 hrs drive from Leh(115kms) crossing a high Khardung La pass, to descend into a green Nubra valley. We are just before Sumur village on the Khalsar-Panamik road (straight at T Junction after Khalsar) take left at our sign board, before Sumur sand dunes turning. If you are coming only for a day then we suggest that once you reach Nubra valley you visit Diskit and Hunder and come to Sumur by evening, on the next day you visit Sumur and Panamik. Nubra is not connected to the electricity grid, it only gets diesel generated power between 7 and 11pm. Only BSNL mobile network will work in Nubra. For Indian Nationals, Inner Line Permits are required to travel to Nubra. You can apply online here http://www.lahdclehpermit.in/contactfl.php print and submit with ID at the Tourism office in Leh ( opposite J&K Bank, Main market) All foreign nationals will need a Protected Area Permit to visit Nubra. please contact a local travel agent in Leh and get them the day your arrive in Leh. Please share the information that Nubra Ecolodge is in Sumur with your local driver/ guide.